This article appeared originally at nofibs.com.au. I have been travelling in England and Europe for 6 weeks now. It is supposed to be Autumn going into Winter, yet there is still plenty of warmth despite the shorter days. Other than a few days of rain, it has been remarkably fine: T-shirt and shorts weather, although a jacket is sometimes needed for chilly evenings. Even in Switzerland I was wearing T-shirts and shorts, only pulling on a warm jacket for the journey to the top of Mount Titlis at over 3000 metres altitude in the European Alps. I realize with my full bag I have probably brought far too many warm weather clothes expecting much cooler Autumn and Winter temperatures. Or maybe it is that bottle of Limoncello from Sorrento weighting my bag down. October in the United Kingdom had temperatures above the average in almost all places, with less rainfall according to the UK Met Office. Yesterday brought a Halloween surprise. November 1 was abnormally warm across the United Kingdom and France. It was the hottest November day on record for the UK with a top temperature of 22.3C recorded in mid Wales at in Trawsgoed, in Ceredigion. 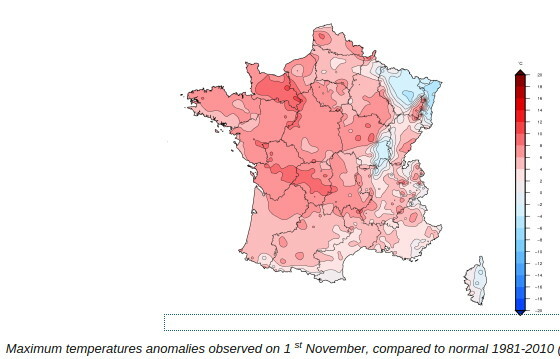 Halloween heat in France, Nov 1, 2015[/caption]Across the channel in France the heat was also on. The French Bureau of Meteorology in a media release said that many monthly records were established for Sunday 1st November. The West of France was particularly warm including from the Charente and Dordogne to the coasts of the English Channel. In Brittany and Normandy, the vast majority of weather stations had record maximum temperatures for November. According to Météo-France: in Rennes, Nantes, Caen, Saint-Brieuc, Brest, Lorient, Rouen, Le Havre, records for November were well matched or beaten, sometimes significantly, with values ​​between 19 and 22 ° C, or 6-9 degrees above normal. "The old records are sometimes beaten largely (about 2 degrees) as in Caen (21.6 ° C), Ploumanac'h (22.0 ° C), Cholet (21.7 ° C) and Cherbourg (20.8 ° C ). It also records a little further south records in Niort (22.7 ° C), La Rochelle (22.5 ° C), Limoges (22.8 ° C) or Tours (21.2 ° C). In Bergerac, the 23.2 ° C recorded increased the record of 2014. Yesterday I travelled from Paris to Nantes on the high speed TGV train and can attest to the summer-like temperatures, although I wondered when Australia might see the efficiency of high speed rail in moving people and connecting the regions and capital cities. Earlier in my trip, When I took a cruise on Lake Lucerne in Switzerland on 20 October, Stephan, the captain of the Pegasus, made a number of observations on the weather and climate. He told us that water temperatures reached a maximum of 24 degrees C during the summer. But air temperatures during the July heatwave reached 37 degrees C. This year was the 2nd hottest after the phenomenal 2003 summer heatwave which contributed to over 70,000 deaths across Europe. Researchers have already claimed that Europe's extreme heatwave frequency is increased by climate change. While temperatures approaching or exceeding 40C may be sometimes experienced in India, and Pakistan just before the onset of the monsoon, other tropical regions or many parts of Australia, extreme temperatures of 37C are rare in Switzerland. This poses a major health risk to people unfamiliar with living in countries not acclimatised to these heat extremes. Stephan, our cruise captain, observed that there were still swallows around Lucerne in mid October feeding on insects, when usually they migrate to Africa by end of September. He told us that the water quality of Lake Lucerne is good with 50 percent of Lucerne's water supply being lake water and the rest from groundwater and springwater. 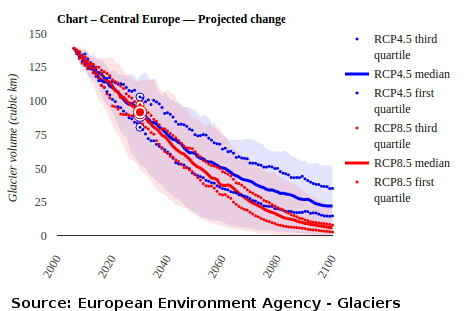 Projected reduction in European Alps glacier volume[/caption]A three degrees C increase in average summer air temperature could reduce the existing glacier cover of the European Alps by approximately 80 percent according to the European Environment Agency. Under present climate modelling nearly all the smaller glaciers and one third of the overall glacier area in Norway are projected to disappear by 2100. Glacier retreat has serious consequences for river flow. It affects freshwater supply, river navigation, irrigation and power generation. It could cause natural hazards and damage to infrastructure. Swiss authorities are very concerned about reduction of glaciers in the Alps and the climate impact on groundwater and landscape. 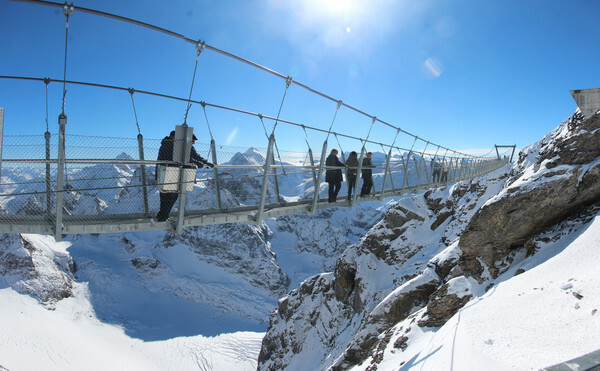 I spent with my tour group an exhilarating ascent by funicular railway and 3 cable cars to the summit station on Mount Titlis at 3 238 metres altitude, where ice and snow abound year round. No doubt snow and ice will still be up at this altitude by the end of the century, but much of the glaciers will have retreated. 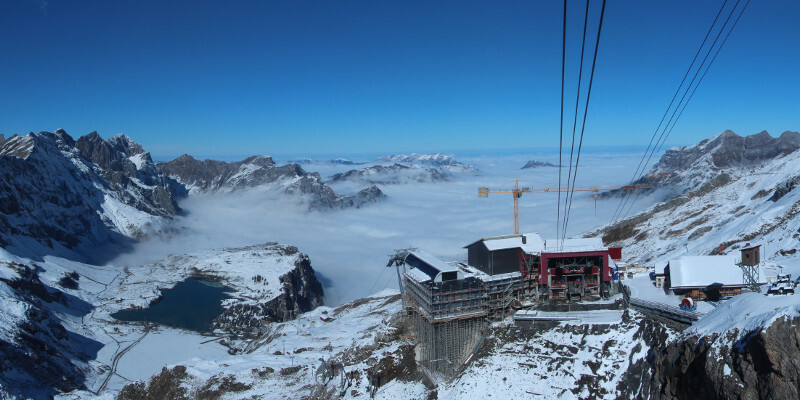 Indeed, snow cover is expected to drastically decrease below 1500–2000 m elevation according to a 2014 scientific review by Andreas Gobiet et al titled 21st century climate change in the European Alps — A review. We were told on the coach tour how the Swiss have engineered a major system of tunnels in the Swiss Alps as fallout shelters to house all Swiss citizens for up to a year in case of a nuclear conflagration. While radiation would eventually subside after a nuclear war, the problems with climate change is much more insidious and all encompassing. Retreat is simply not an option. Hence Switzerland was one of the early countries to contribute their climate pledge to the United Nations, and it was a significant pledge for a rich but small country to make. The Swiss promised to cut climate emissions by 50 per cent on 1990 levels by 2030. Thanks @takvera for great news! "Switzerland targets 50% reduction in greenhouse gas emissions by 2030" https://t.co/AfWkZLyjII and for Oz?? In Italy I didn't see many wind farms, but there were several solar farms beside the roads I travelled on. 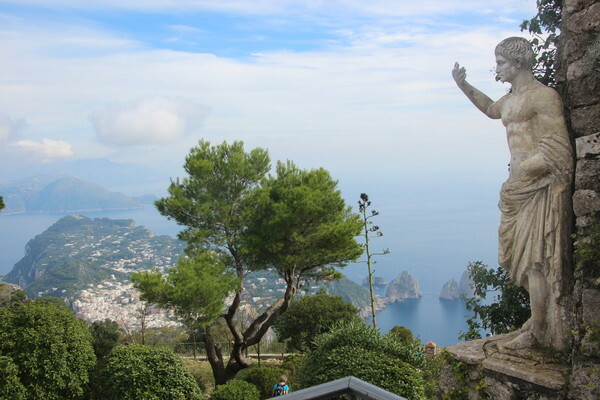 My tour took me to the Isle of Capri in the Bay of Naples, the isle of the rich and famous since Roman times with a warm Mediterranean climate but suffering long dry spells without rain. I took the chairlift ride to the very top of Capri and could not see one solar panel on the white roofs of the town of Anacapri spread out below. Elevated parts of the town of Capri have banned petrol and diesel vehicles, substituting small electric powered vehicles to deliver goods. This is the most exclusive and wealthy urban part of Capri. This was done for the benefit of the rich visitors than out of more prosaic environmental concern. @takvera @melbpoly Capri has always been the holiday destination for the rich starting with Emperor Tiberius! Always had water issues too. If every developed country pledged similar to Switzerland we would be well on the way to limiting warming to perhaps less than 2 degrees this century. Instead, the United Nations released a synthesis report which aggregated the 146 Intended Nationally Determined Contributions (INDCs) that had been received by 1 October. "The INDCs have the capability of limiting the forecast temperature rise to around 2.7 degrees Celsius by 2100, by no means enough but a lot lower than the estimated four, five, or more degrees of warming projected by many prior to the INDCs,” said Ms. Figueres in a UNFCCC media statement. Eighty six percent of global greenhouse gas emissions are covered by the 146 INDC plans submitted, which includes all developed nations and three quarters of developing countries. A number of submissions were recieved after the 1st October date which pushes the pledge count to 156, covering 92% of emissions. Carbon Brief have done an article which highlights that the "INDCs represent an improvement in ambition, albeit a relatively small one." Other analysis by the International Energy Agency (IEA) and Climate Action Tracker also show that with current INDC pledges we are heading for 2.7 degrees C.
And where does Australia stand? We are still committed to 5 per cent on 2000 levels by 2020, and 26-28 per cent cut on 2005 levels by 2030. These targets place us near the bottom of ambition, a clear climate laggard. Our post 2020 targets are at least half of what is really needed, but with Government modelling showing there is room to increase the targets to 45 percent on 2005 levels with minimal economic impact. Into this we hear that Foreign Minister Julie Bishop wants to co-chair the Green Climate Fund. Ms Bishop announced a contribution of $200 million to this fund at COP20 in Lima, against the objections of then Prime Minister Tony Abbott. But our poor climate targets and minimal late contribution to this fund makes this bid real life satire.